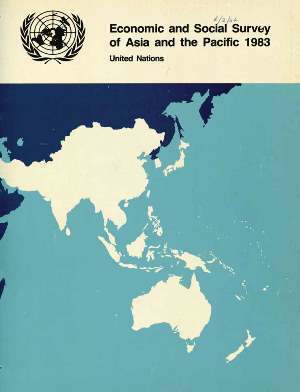 This is the thirty-seventh annual Economic and Social Survey of Asia and the Pacific (until 1974 entitled the Economic Survey of Asia and the Far East) and consists of a review and appraisal of the implementation of the International Development Strategy for the Third United Nations Development Decade in the developing ESCAP region. It is presented in two parts. Part One contains a survey of recent economic performance in the context of the world economic situation and Part Two an analysis of major policies and policy instruments relevant to the achievement of goals and objectives of the International Development Strategy in selected sectors. During the first three years of the Decade, the international economic environment has not been conducive to the rapid growth of the economies of developing countries. The adverse consequences of a sharp decline in the prices of primary commodities produced in developing countries and increased protectionist barriers against their exports of both primary and manufactured products were aggravated by a reduced flow of official development assistance, high interest costs and reduced access to private credit markets. Most developing ESCAP economies suffered from a deterioration in their balance of trade, in spite of cutbacks in imports, an increase in debt-service liabilities and a reduction in growth rates. The least developed countries were affected more severely. The signs of world economic recovery, which appear to have become firmer in recent months, provide room for some optimism. However, there remain well-founded concerns regarding its strength and its eventual beneficial impact upon developing countries. Against this background, countries of the region have initiated policy measures in many sectors to achieve the goals and objectives of the Strategy. Efforts are being made to increase productivity in agriculture through the wider application of high-yield technology. Industrial policies are being increasingly oriented towards the rationalization of incentive structures and improved efficiency in factor use. The conservation of energy and the increase of domestic production feature prominently as objectives in energy policies. The expansion of transport services is being complemented by measures to improve the efficiency of existing facilities. Incentives have been introduced to diversify the commodity composition of exports. A greater awareness of the problems of poverty, unemployment and inequity is manifest in policies directed towards agrarian reforms, improvements in health, education and housing, and employment promotion. There, no doubt, remains vast scope for improving the effectiveness of policy interventions. The internal pressures for accelerated growth and the equitable distribution of the fruits of development will impel Governments to keep up the momentum for reform. In the course of the mid-term review of the International Development Strategy for the Third United Nations Development Decade by the General Assembly, the international community will need to devote its attention with renewed vigour to the creation of an environment conducive to the sustained growth of developing countries and to the restructuring of international economic relations.